I've seen one article where the canes end up 3 points better than last season. I'll wait. Gleason, a middle weight, also "took no prisoners". Close when one ended up with the other's wife? I'm sorry but Gleason wasn't anything approaching a middle weight. Grumpy Gleason could rock anybody's day. He was also a warrior. And who can forget the "energizer bunny" . Middle weight IN SIZE ONLY coastal, I agree, but like you, I saw him take on all comers. Never forget his style, his fists were like jack hammers as he pummeled whoever. "Wally, dig around in the box and find Timmy a nose and a fish bowl, and get him back out there"
I've always wondered what the real feelings are between two guys who have hated each other enough to fight becoming teammates. Sure the professional PC thing is to say we're good but was Scotty Walker and Aaron Ward really good? I kinda doubt it. If Cam said he and Leighton were I'd semi believe it. I didn't know how much I would love this punch at the time. Wish Aaron Ward had never came back completely ruined the high regard I held him in. PDG & Fleury are the extras. 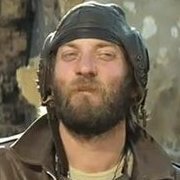 the emergency goalie (Alves) is out there with Mrazek. No sign of Darling. i do not like those 2 last lines. The knock on our bluest of blue chip prospects has been refusal to participate defensively so Roddie taking a new approach to introducing a top 5 pick into the NHL with bottom minutes earning his way up would be a welcome change. Foegele get's away with it because he's earned his road to the NHL through the AHL and should know what's expected from his 2 way game. However we all somewhat know if we want a chance at the playoffs Svech needs to replace Skin's production, that will be difficult to do if the 4th line lasts long for him. Unless Foegele is a dark horse and puts up 60. Yeah it’s a waste to have Svechnikov on our 4th line. He’s scored 5pts in 5 games. I know they don’t want to put two rookies together, but Svechnikov is better off on Necas’ line than only playing 7mins a night. Hope this doesn’t stick. 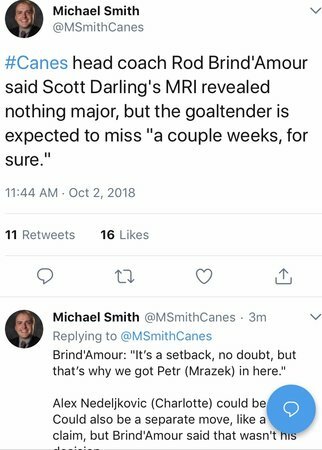 Again according to Cory Lavalette, Brindy stated Darling was going to be out a couple of weeks. Claim a TML Goalie on waivers? 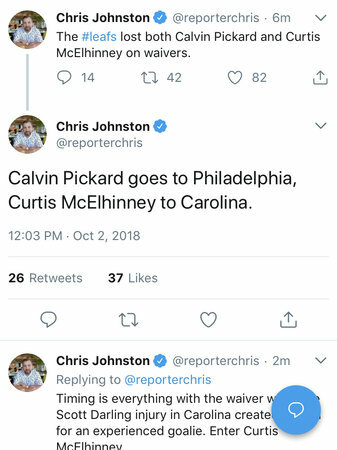 Very good move, he was quite reliable in Toronto last year. Darling can have a rest, or be sent to CLT, or bought out. We really couldn't let a .934 goalie go through waivers even if Darling was healthy. If McE fails we just put him on waivers and he'll be claimed with little to no worry about that. If Mrazek fails, frankly another easily disposed of goalie I doubt he makes it through waivers. If Darling fails though......he'll likely wind up in Charlotte. A tough break for Darling get's tougher he's gotta beat out 2 goalies for the job and I'd imagine his heart just sunk through the floor hearing this. I hope he responds properly. Not likely- A Lot of effort spent to rehab him. A businessman aint likely to throw millions of dollars down the drain. This injury does not change the equation.